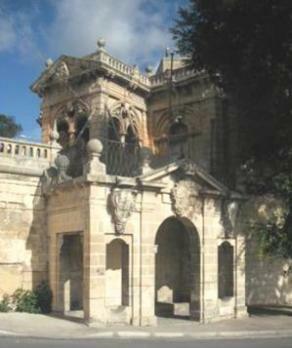 The Saqqajja wash house (għajn tal-ħasselin) was erected here to take advantage of a natural spring. The building consists of a rectangular shaped structure having a central arched doorway crowned by the coat-of-arms of Grand Master de Rohan. The doorway is flanked by two large vertical windows that are also crowned by two escutcheons. One of the coat-of-arms most probably represents the Mdina flag, while the other cannot be identified with a high degree of certainty. Its upper part consists of the coat-of-arms of de Rohan, the lower part has a star above three hills which stand above waves. The central part of the wash house is crowned by a classical pediment while four large spherical finials decorate the four corners. The Saqqaja wash house at Rabat was included in the Antiquities Protection List of 1932 and was scheduled by Mepa as a Grade 1 national monument as per Government Notice number 1082/09 in the Government Gazette dated December 11, 2009.